There are different perspectives on salmon escapements. Perspectives of managers are based on estimates of the total number of salmon entering the river and then the cross boundary escapement to Canada. The estimates are used to make decisions on openings for the fisheries. The perspectives of fishers are more complex. They will be mainly based on the numbers, and condition, of the salmon they catch. Their perspectives may also be based on long term local experience and oral tradition. This may include periods of abundance and scarcity. This may cause a difference in perception of escapement between managers and fishers. The fishery manager’s perspective of escapement may be based on achieving the greatest number of returning adults from the lowest numbers of fish allowed to spawn. They do this from estimates of salmon returning to spawn and calculations of how many salmon will be produced from each salmon that spawns. Lower numbers of salmon produce more adults per spawner. Very high numbers of salmon produce less adults per spawner. Environmental conditions or risks are not considered. 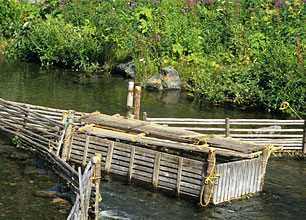 Fishers’ perspective of escapement is usually based on having sufficient spawners to ensure the safety of the salmon run and the fishery under all environmental conditions.